Around the world today, billions of people live in fear and desperation, with impure water, inadequate food, and little or no access to health care. Behind every statistic is a person waiting for hope and healing. MISSION: Mercy Ships, a global charity, has operated a fleet of hospital ships in developing nations since 1978. Following the example of Jesus, Mercy Ships brings hope and healing to the poor, mobilizing people and resources worldwide. VISION: Mercy Ships seeks to become the face of love in action, bringing hope and healing to the poor. Be people of excellence in all we say and do. Performed more than 32,500 surgeries such as cleft lip and palate, cataract removal, straightening of crossed eyes, orthopaedic and facial reconstruction. Treated more than 212,000 people in village medical clinics. Performed more than 183,000 dental treatments. Taught over 14,500 local health care and professional workers, who have in turn trained many others in primary health care. Taught 95,000 local people in primary health care. Trained local medical professionals in modern health care techniques. Delivered more than $60 million worth of medical equipment, hospital supplies and medicines. Completed more than 900 community development projects including construction of schools, clinics, orphanages, water wells and agriculture programs. Demonstrated the love of God to people in over 550 port visits in 70 different nations. More than 850 career crew from over 40 nations serve today. More than 1,600 short-term volunteers serve with Mercy Ships each year. 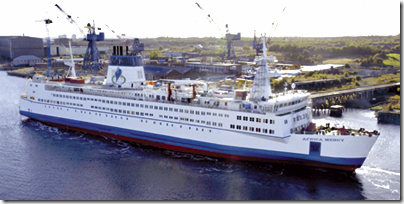 History:Acquired in 1999, the Dronning Ingrid underwent conversion from a Danish rail ferry into the world’s largest non-governmental hospital ship. Sponsored by corporate and individual donors, the purposebuilt Africa Mercy, with six operating rooms and a 78-bed ward, effectively doubles the annual medical capacity of her predecessors. Hospital:The hospital is divided into quadrants containing; supply/services, 6 operating rooms, recovery/intensive care and low dependency wards totalling 78 patient beds. Surgical capacity is approximately 7,000 surgical interventions onboard in one year including; cataract removal/lens implant, tumor removal, cleft lip and palate econstruction, orthopaedics and obstetric fistula repair. The hospital contains a CT Scan as well as X-Ray, laboratory services and a Nikon Coolscope which allows remote diagnosis. These diagnosis are transmitted, along with all other data and telephone calls, via an onboard satellite communication system. Programs Ashore:In addition to the surgeries performed onboard, ship-based teams serve in local villages providing a wide array of services to increase health and well-being which include; dental clinics, medical clinics, community health education, HIV/AIDS intervention, water and sanitation projects including well drilling, construction, agriculture and micro-enterprise projects. Accommodation:The Africa Mercy has meeting and work spaces as well as berths for an average crew of 450. The 474 berths include 26 family cabins, 25 couples/2 berth cabins, and the balance consisting of 1, 2, 3, and 4 berth cabins. Safety & Security:The vessel is fitted with an automatic sprinkler system throughout the accommodation and hospital areas. An addressable smoke detector system pinpoints the exact location of the source of any potential fire. Machinery spaces are covered by CO2 gas flooding system as well as a “Hi Fog” system which can be very effective in controlling localized fires in the machinery space.Security Guards man the gangway 24 hours a day with a metal detector and other screening devices. They are backed up by CCTV around the vessel,while critical spaces such as the bridge and engine room remain locked at all times. 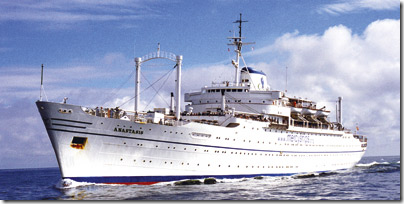 Formerly the Victoria, the Anastasis was built in 1953 as an Italian passenger liner and served as the flagship of the Mercy Ships fleet from 1978 to 2007. Over the past 29 years, the Anastasis has contributed more than half of Mercy Ships total output in terms of number of services, value and beneficiaries. An average of 350 crew from more than 30 nations lived and worked onboard. Formerly a Norwegian ferry, the Caribbean Mercy was acquired by Mercy Ships in 1994. In her 12-year history as a Mercy Ship, the Caribbean Mercy visited 137 total ports, conducting field service assignments in 56 port visits to 13 different developing nations, primarily in Central America and the Caribbean basin. An average crew of 120 volunteers from more than 20 nations served onboard. The former Newfoundland coastal ferry Petite Forte was donated to Mercy Ships in 1983. She sailed for 11 years as the Good Samaritan serving the Caribbean, Central and South America, until 1994 when she was renamed the Island Mercy and redeployed to the South Pacific where she served until 2001. 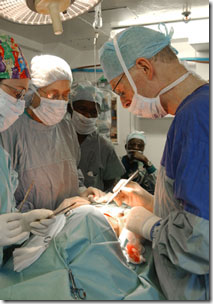 The vessel went through extensive renovations including the building of operating theatres onboard. The ship was sold in 2001 to a Philippine interest. Mercy ships is presently operating only Africa Mercy. The other ships have retired. To increase and widen the reach of this charity, Mercy Ships requires donations from one and all. Mercy Ships national office locations around the world raise funds and awareness, recruit volunteers to serve on the ships and field, and procure gifts-in-kind. For details about locations click here. OldSailor deeply appreciates Mercy Ships for their noble cause and requests marine community to donate.